Fond du Lac County is a county located in the state of Wisconsin. Based on the 2010 census, the population was 101,633. Its county seat is Fond du Lac. 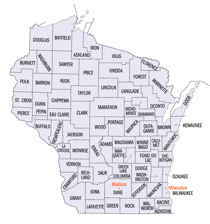 The county was created in the Wisconsin Territory in 1836 and later organized in 1844. Fond du Lac is French for "bottom of the lake", so given because of the county's location at the southern shore of Lake Winnebago. Fond du Lac County comprises the Fond du Lac, WI Metropolitan Statistical Area. Fond du Lac County was named for its situation at the end of Lake Winnebago, being a French term for the head of a lake - Wis. Hist. Colls., i, p. 112. "FOND DU LAC, County, is bounded on the north by Winnebago and Calumet, on the east by Calumet and Sheboygan, on the south by Washington and Dodge, and on the west by Marquette and portions of Dodge and Winnebago. Its name is derived from its locality, being at the "end of the lake." 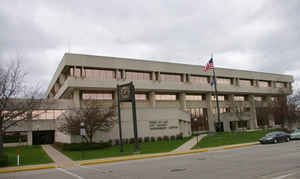 The seat of justice is at the city of Fond du Lac, at the head of Lake Winnebago. This county is generally well watered with springs, brooks, and small streams of pure water. The largest streams in the western part of the county are the two branches of the Rock river; one flowing eastwardly through the towns of Alto and Waupun, and the other rising in Metomon, and flowing southwardly through Springvale and the eastern part of Waupun. There are also the two branchles of Fond du Lac river (the east and west); the one rising in the town of Rosendale, and passing through a portion of Eldorado and Lamartine, and the other (the east) rising from small streams and springs in the towns of Lamartine, Oakfield, and Byron, and passing through the town of Fond du Lac, unites with its west branch within the city, about a mile from lake Winnebago. There is also another beautiful stream, known as the Crystal Creek, (or the Green lake inlet), passing westwardly through the town of Ceresco into Marquette county, affording, at the villages of Ripon and Ceresco, some of the best water power in the county; and also Grand river, which rises and runs southwesterly through Metomon, affording excellent water power at the village of Fairwater. In the eastern and southern portions of the county are several small lakes and numerous streams, also affording good water power. The most northerly branch of the Milwaukee river rises in a small lake in the town of Eden, within about eight miles of Winnebago lake, and flows southerly through the town of Auburn, where there are numerous water powers. Another fine stream rises in Dodge county, and flows eastwardly through the town of Ashford, and unites with the last mentioned stream near the south line of Auburn. The east branch of the Milwauklee river rises by separate branches in the towns of Empire and Forest, and flows through the town of Osceola, passing through Long Lake, and affording excellent water power at its outlet. It is worthy of remark that the lake in Eden, which gives origin to the Milwaukee river, is also the source of a small stream running northwardly into lake Winnebago, and is within a mile or so of the source of the Sheboygan river, which runs north and eastwardly through the towns of Forest and Kossuth; affording, also, more or less water power to those towns. In the northeast part of the county, in the town of Taycheedah, and within 3 miles of lake Winnebago, arises the southerly branch of Manitowoc river, which runs northeasterly through the town of Calumet into the county of that name. In addition to these, there are numerous small streams and branches of the above mentioned rivers, watering almost every portion of the county. Water powers are already improved in the city and town of Fond du Lac, in Ceresco, the village of Ripon, Metomon, Eldorado, Oakfield, Alto, Waupun, Ashford, Auburn, Osceola, Empire, and Forest. The soil of the county is somewhat diversified. The eastern and southeastern portions being mostly heavy timbered land, having a dark, rich soil in the bottoms, and fine gravelly ridges upon the swells. In the western portion, which is composed of small prairies and openings, and indeed in the whole open portion of the country, which comprises more than two-thirds of the whole area, the soil is an argillaceous loam, moderately mixed with sand and lime, resting on a thin layer of limestone much broken, and occasionally interspersed with knobs of drift gravel. Underlaying a considerable portion of the whole is a red sandstone, which occasionally outcrops in ravines. On many of the highest points of the prairies and openings, in the towns of Ceresco, Metomon, Waupun, Lamartine, Oakfield, Byron, Empire, Taycheedah, and Calumet, the limestone comes to the surface, affording thle best of material for building and fencing; and in many places furnishing the most beautiful flagging stones of any thickness, from one inch to ten, of a texture nearly as fine and compact as marble. The face of the country is gently rolling, and from the quality of the soil, the county is well adapted to all the more northern productions of agriculture. The peculiar geographlical position of this country, erabracng nearly the southern half of Winnebago lake, which is connected with the great lakes by Fox river and Green Bay, and being, within some thirty-five miles of lake Michigan, at Sheboygan, as well as the character of its soil, renders it one of the most important inland counties. The population in 1840 was 139; 1842, 295; 1846, 3,514; 1847, 7,459. Dwellings, 2,722; farms, 1,073; manufactories, 16." Population 24,085; in 1850,15,511; increase 10,574. This County lies in the eastern part of the State, and is one of the oldest, if the term old can be applied where all is new. It was incorporated in 1836, but remained under the tutelage of Brown till 1839. Less than fourteen years ago the writer had occasion to address circulars to different portions of the State, the one marked "Fond du Lac," was refused at the Post Office on the ground that there was no Post Office in that County!. It is a beautiful and excellent agricultural County, embracing within itself almost all the products of Wisconsin. It is rolling, diversified with prairies, openings, timber and marsh; and is healthy, prosperous, and fast becoming rich. "As a whole, the soil of Fond du Lac County is not surpassed in fertility by any in the west. There probably is no tract of land of equal extent where less waste surface will be encountered by the agriculturist. The low lands are good meadows, or are the repositories of muck and shell marl, by which the adjoining high lands will be enriched for ages. In point of good building material, this County is liberally supplied with stone, the best of clay for brick, limestone for cement and walls, are every where abundant." Fond du Lac, the County Seat, is located at the head of Lake Winnebago, and has steamboat communication with all the places on that Lake, and up the Rivers which flow into it. The northern terminus of the Fox River Valley Rail Road is at this point. It is already run to Waupun, about 18 miles, where it will shortly be met by the Milwaukee and Horicon Road. The City possesses a good trade, and its growth has been and still continues to be very rapid. The population of the City and Town is 5,083. At Waupun, a thriving agricultural village, is located the State Prison. A temporary wooden building was erected in 1851. In 1854, a new stone edifice, intended as the south wing of the whole prison when completed, was built. The size of this wing is 204 by 54 feet, four stories high, capable of receiving 288 prisoners. Ripon, another of those magic places which spring into manhood before the geographer can locate them, has, within three years, been built in the town of Ceresco, in the western part of the County. It is a thriving place--has its college edifice, its newspaper, and its innumerable signs of population and enterprise. Brockway College has not yet gone into operation as a college, though its building is erected, and an excellent collegiate school in operation. There are no public lands in the County. We are indebted for most of the above facts to an excellent pamphlet entitled a "History of the County of Fond du Lac," by Martin Mitchell, Esq., who, with commendable enterprise, has put on record the early history of the County, before the facts are forgotten. As reported by the Census Bureau, the county has a total area of 766 square miles (1,983 km2), of which, 723 square miles (1,872 km2) of it is land and 43 square miles (111 km2) of it (5.60%) is water.